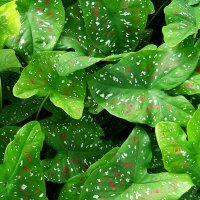 Begonias,dahlias,fuchias,gerberas,pot cyclamens,ferns and other greenhouse plants. 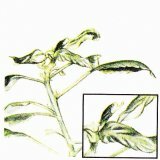 Leaves distorted in severe infestations, or slightly curled at edges: slightly thickened and brittle. Leaves tightly rolled down along their whole length. Remove and burn affected leaves in May and early June if possible, or spray with trichlorphon,BHC or a systemic insecticide at fortnightly intervals in May. 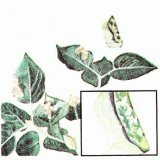 Plants affected: Lilacs and privet. 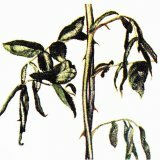 Symptoms: Tissues of leaves almost completely eaten away; leaves distorted and rolled. Treatment: Pick off and burn affected leaves and spray with BHC in May. Repeat if necessary. Symptoms: Young leaves unisually narrow and die off prematurely. 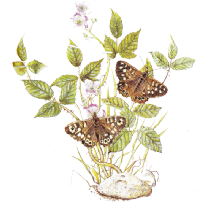 Treatment: Remove and burn severely affected plants. Clean stocks may be raised by taking root cuttings, but do not replant in infected soil.